A HEPA breach can be detected during the prescribed AQL sterility sampling of the product, during required environmental monitoring, or during the biannual HEPA certification process. However, a more substantial engineering solution was needed to ensure that the products manufactured by BioTechnique maintained the highest possible quality standards. After the product is formulated, filled, inspected, labeled, packaged, tested and released, there is no more opportunity to detect a quality issue. BioTechnique management therefore mandated, after assessing the potential impact to patient safety, that the Engineering Department seek a solution to improve the reliability of the manufacturing process and the quality of the product, while at the same time reducing the facility’s energy consumption. In late 2014, the company embarked on a Lean Six Sigma project to improve the reliability of its manufacturing facility and reduce the energy costs of maintaining the Grade A (ISO 5), Grade B (ISO 6), Grade C (ISO 7) and Grade D (ISO 8) areas. Federal, state and local energy incentives, such as the State of California Title 24 program, have encouraged many pharmaceutical firms like BioTechnique to initiate energy conservation projects. To ensure no statistical bias, BioTechnique constructed a test rig that would allow testing in a controlled environment, ensuring that the testing methodology was statistically sound and reproducible, and would produce meaningful data to draw a defendable conclusion. The study was composed of tests that were conducted three times, each time using three filters of each type, including two traditional microglass HEPAs and the 50mm and 75mm ePTFE HEPA filters. This study therefore utilized 36 different tests, resulting in a statistically meaningful study. In October 2015, two competing sets of filters (AAF Flanders MEGAcel® II and Camfil Megalam®) were installed in two separate ISO 5 critical rooms and tested for FDA Certification multiple times. The results confirmed that AAF Flanders’ MEGAcel II Pharmaceutical Grade ePTFE Filtration Technology is not only completely PAO compatible, it also performs at the highest level in critical areas. Because the MEGAcel II filters were significantly lighter, installation was accomplished with a single person, while the microglass HEPA filter install was a two-person job. This labor savings advantage was especially important when installing such a significant amount of filters. The filter could be held in one hand and a screwdriver in the other, allowing for a faster installment. An additional advantage was the stress-free nature of the install—with the stronger and more robust filter, there was less worry about damage to the filter itself. AAF Flanders' MEGAcel II filters outperformed the competition with a 100% leak-free certification. ePTFE filters reduced filter failure and environmental monitoring excursions, resulting in lower production loss and labor costs. 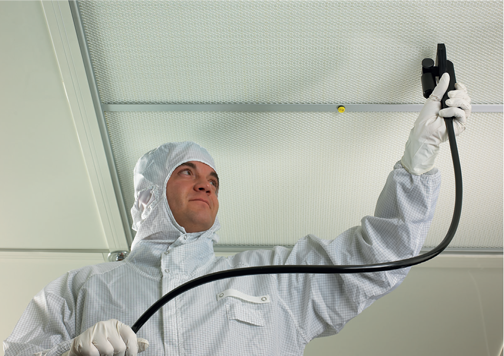 Utilizing ePTFE filters increased BioTechnique’s time between recertifications, increasing cleanroom uptime. The lighter weight of the MEGAcel II filters allowed for a quicker installation—a labor savings advantage. 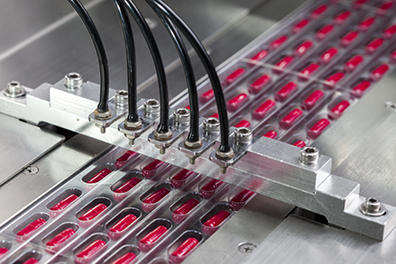 Within the pharmaceutical industry, strict requirements for air purity levels are necessary because of the direct effect that airborne contamination has on the quality of pharmaceutical products. AAF Flanders provides you professional guidance and analysis for cost savings by conducting a thorough air filtration audit. Using HEPA filters with microglass media can lead to decreased production time, increased repair time, and increased energy consumption. The only HEPA filter media that is highly resistant to chemical degradation is ePTFE.